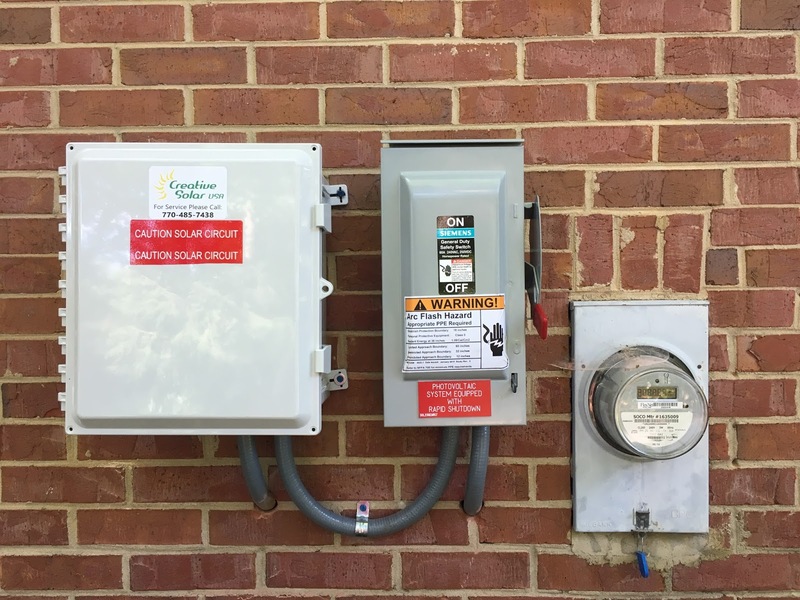 Banana Stew: Suburban 5-4-and-a-door solar: We have electrical hookups! 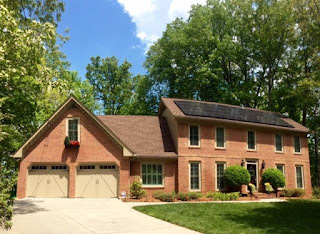 Suburban 5-4-and-a-door solar: We have electrical hookups! 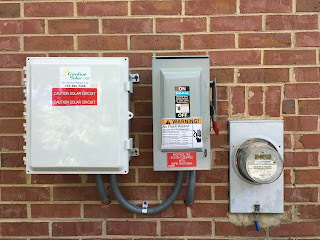 As of this week, we have electrical hookups to our solar panels. 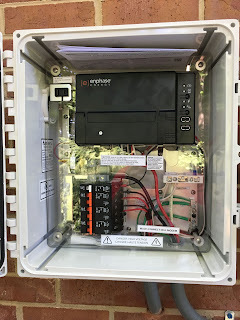 Nothing's turned on yet, as we are awaiting approval from the city inspectors, but at least all of the hardware installation is now complete. Here's what we have in place. It's not at all intrusive. First, there are the solar panels themselves. Feel free to stop by and take a look at them. You honestly wouldn't notice them if you weren't looking - they show up much more prominently in this picture because it was taken from a drone. There's a tree in the front yard that hides them from most passers-by. Not that we're ashamed of them. We kind of like the way they look. The outside of our house used to just have that one meter on the right - the typical spinny-wheel thing. Now we have two additional boxes, one that combines the sources and one that is an emergency shutoff / breaker specifically for the solar circuit. Inside the box on the left are the combined connections and a cool internet-enabled meter that is purported to have an associated app that will allow us to see how much power we're pulling from the grid and how much we're pulling from the solar panels. It's purported because we aren't allowed to turn it on until after inspection completed. The box on the right has some very large fuses and a big on/off switch straight out of Dr. Frankenstein's lab. 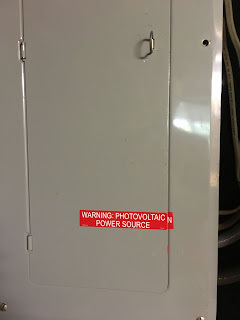 We assume that this is used to shut off power from the solar panels when service need to be done on the house. 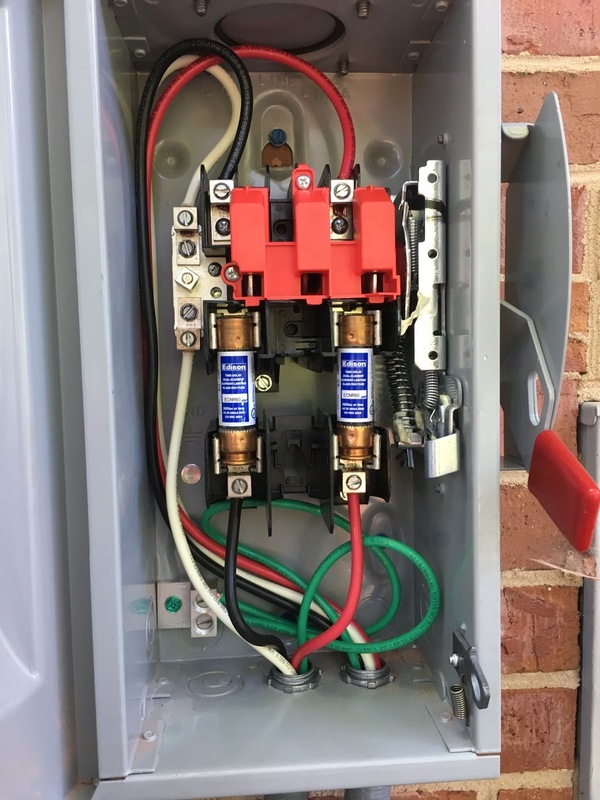 We will confirm that before turning on the system - and we will find out if we need to keep large fuses in stock, just in case. 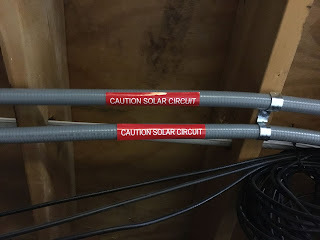 Inside the house, all of the wiring was very expertly run inside conduit like these, carefully attached to floor joists. 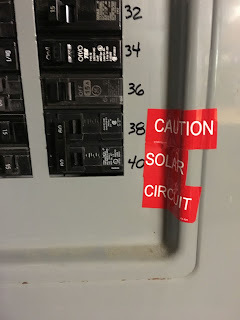 The power feed from the panels on the roof was run down a utility chase from the attic to the fuse panel in the basement. It took a little while to get everything run, but the results look great and there are no wires on the outside of the house. 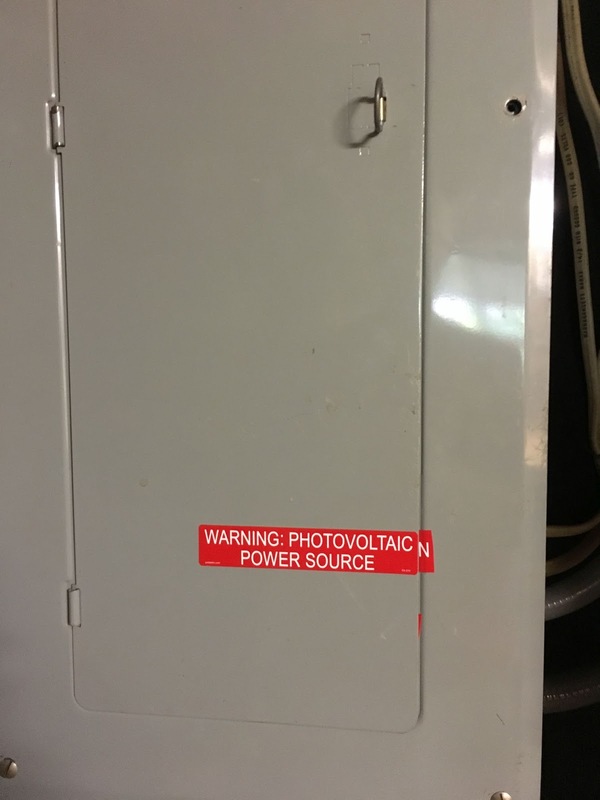 There are more warnings inside the breaker box. 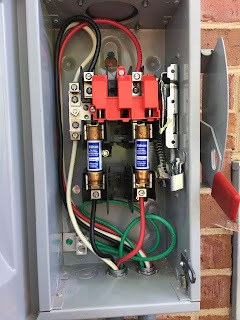 We were actually tapped out on the breaker box, but the installer was able to put in some half-sized breakers and expand the capacity without installing a new box. Overall, we are very happy with the results so far and are eager to get the system running! It's starting to get hot out there.